When your hair needs a little TLC and shampoo and conditioner just aren’t cutting it, a good leave-in conditioner can come to the rescue. It can hydrate and condition the hair without leaving it feeling greasy or weighed down. It can also prevent static electricity, fight humidity, detangle strands, reduce flyways, and tame frizz, giving even damaged tresses new life. 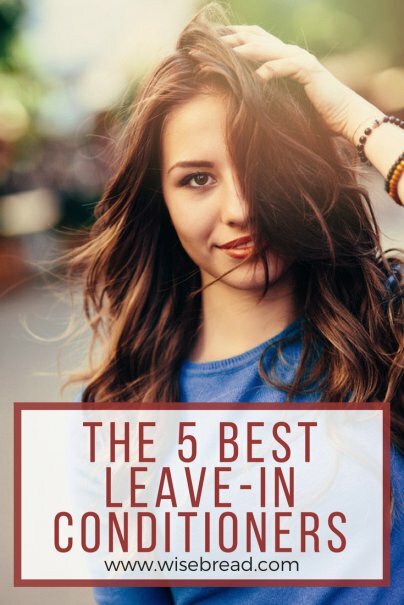 Most hairstylists agree that moisturizing the hair is just as important as moisturizing the skin, which is why a good leave-in conditioner should be an integral part of your hair care regimen. By adding lightweight moisture to the hair, you can hydrate and repair dry, frizzy strands. After using a leave-in conditioner, your hair should be shiny, silky smooth, and more manageable, saving you time when you’re combing or styling your hair. The Garnier Fructis Sleek & Shine Intensely Smooth Leave-In Conditioning Cream is ideal for frizzy, dry, and unmanageable hair. The frizz-fighting formula will leave your hair smooth, shiny, manageable, and renewed, without weighing it down or leaving it feeling greasy. In fact, it promises to provide you with 10x smoother hair that will stay sleek for three days, even in 97% humidity. It has a powerful combination of vitamins, Nutritive Fruit Micro-Oils, argan oil from Morocco, and apricot and avocado oils that soak deep into the hair to smooth each strand. The thick cream consistency can be gently applied to curls with your hands. Reviewers call this their “go-to” and a “lifesaver” for their curly, frizzy hair. They also tend to love the fruity scent. It is backed by outstanding reviews and is recommended by StyleCaster. If split ends are a problem for you, then the TRESemme Leave-In Conditioning Spray is just what you need. It reduces up to 80% of split ends after only three uses. It can repair split ends, detangle the hair, reduce friction between hair strands, and will leave your hair shiny, healthy, and silky smooth. It creates a soft, smooth finish and makes the hair more manageable for easy styling. The innovative Reconstructing Complex actually binds split ends together and repairs damage as it occurs. It is ideal for all hair types, including fine hair, because it moisturizes the hair without ever weighing it down. The lightweight leave-in comes in a simple spray-in applicator, so you can just spritz it on after you shampoo and condition. Reviewers tend to love the clean scent. This can repair split ends and reduce damage from brushing, which means you may need fewer haircuts and fewer trips to the salon, saving you money over time. It is recommended by Allure and has rave reviews online. Whether you have curly, wavy, frizzy, dry, damaged, chemically treated, or fine hair, the Living Proof No Frizz Leave-in Conditioner will work wonders for you. It's formulated with an exclusive anti-frizz technology and patented Healthy Hair Molecule (OFPMA) that prevents frizz, blocks humidity, helps to block out dirt and oil, and seals in moisture. The sulfate-, oil-, and silicone-free conditioner can revitalize even the driest hair. It will add volume, softness, and shine, while taming ends and flyways for more manageable hair. It has a thick conditioner texture, so you can run a small amount through your hair with your hands. Reviewers tend to love the scent. A little goes a long way, so this should last you a long time. This is recommended by Real Simple and StyleCaster, as well as by salons around the country. If you have curly, wavy, or frizzy hair, then the Ouidad Moisture Lock Leave-in Conditioner can define your curls, reduce frizz, seal the cuticle, and leave you with your best hair yet. It infuses strands with conditioning proteins to improve the condition of your hair and scalp. It blocks humidity, prevents frizz from returning, promotes shine, and keeps the hair shaft hydrated. The lightweight leave-in will detangle, condition, and leave your hair bouncy all day. Your hair will be softer, shinier, healthier, and more manageable, so you can easily style it or use your favorite styling products along with this. The powerful combination of ingredients includes prickly pear cactus extract, green tea leaf extract, vitamins E and B5, and arnica extract. This allows it to draw moisture from the air and seal it in. It has a thick conditioner consistency that doesn’t leave a film behind, so you can apply it evenly with your hands. Reviewers tend to love the powdery scent of this leave-in. A little goes a long way so this should last you a long time. This is a Birchbox pick and is recommended by Allure, StyleCaster, and Into the Gloss. The John Master Organics Detangler is ideal for all hair types, including fine hair and color-treated hair. The all-natural leave-in conditioner and detangler duo can power through any tangles for smooth, silky, shiny hair, without weighing your hair down or making it greasy. It balances scalp oil production and strengthens hair follicles, leaving you with fuller, thicker, more manageable hair. It can replenish lipid levels and restore vitality and shine with every use. The lightweight, nontoxic, silicone- and paraben-free conditioner has powerful nourishing ingredients like aloe, vitamin B5, jojoba oil, coconut oil, soy protein, wheat amino acids, grapefruit, lemon, and neroli oils. Reviewers tend to love the light citrus scent. A very small amount goes a long way, so this will last a long time. This is a Total Beauty Top-Rated Beauty Product and is recommended by Allure. Harper’s Bazaar also recommends the John Masters Organics Green Tea and Calendula Leave-in Conditioning Mist Spray. And those are our recommendations for the best leave-in conditioners. As always, be sure to check Wise Bread's Buying Calendar to learn when and how to buy just about anything!